Yesterday’s San Francisco Chronicle ran an article about 19th-century tombstones turning up on Ocean Beach. Passers-by were puzzled, if not uneasy. “Why are there tombstones on the beach?” they asked. Perhaps they also stopped to say “Now that I think about it, why are there no cemeteries in San Francisco?” The answer is: there used to be, but not any more. Of San Francisco’s 27 historical cemeteries, only two (Mission Delores, and The Presidio) remain: the rest are now in Colma. 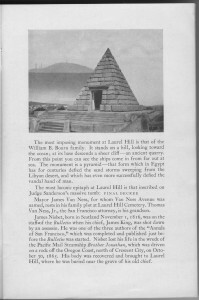 The long, slow process began in 1900, when the City passed an ordinance forbidding new burials in San Francisco, and completed in the early 1940s, when the last graves at Laurel Hill Cemetery were transferred to Colma. The reasons behind the move were many. Many people didn’t want to live next to a graveyard; others felt land values were lower near cemeteries. 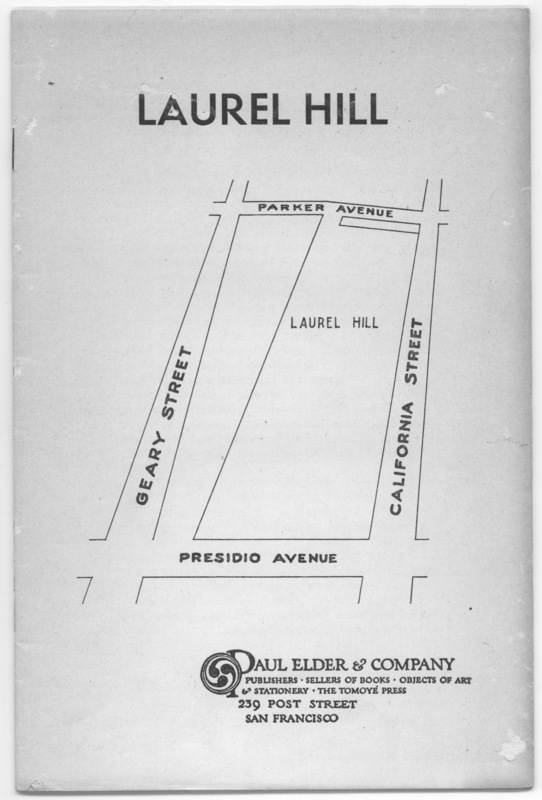 Developers wanted the land for residential and commercial use. Still others felt that cemeteries posed a health risk. 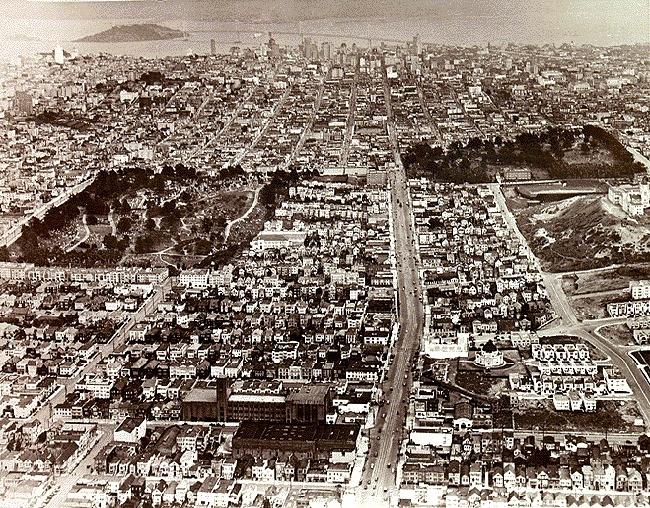 Opposing the removals were religious groups—primarily the Catholic Church—and preservationists, who noted the long list of San Francisco pioneers buried there. 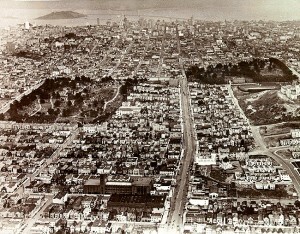 The Richmond District in 1938. 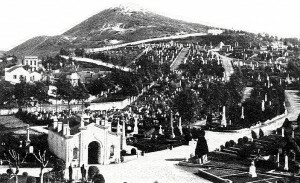 Laurel Hill Cemetery is at center left. Removal of the burials has just recently begun. 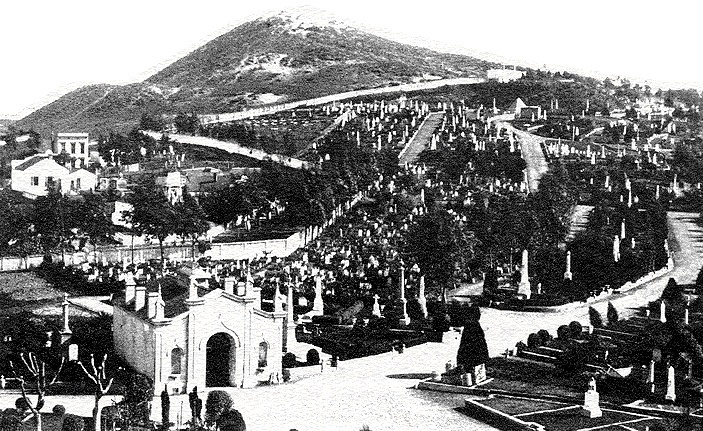 Although the city of San Francisco paid for moving the coffins, the families had to pay the cost of moving the headstones and monuments. Many if not most could not afford this, so the city took the stones and used them in very unromantic places: some as paving materials for gutters lining the walks of Buena Vista Park, others for Ocean Beach and the breakwater near the St. Francis Yacht Club. Particularly saddening was the loss of the large crypts and Egyptian-style monuments, most of which were unceremoniously dumped into San Francisco Bay. We are in receipt of communications, from time to time, from a group that seems bent upon the destruction of Laurel Hill Memorial Park, wherein emphasis is placed on the statement that no real estate considerations are prompting the attempt. It is good to hear this, but difficult, assuming the fact is so, to understand what other motives are prompting the drive to destroy one of our most cherished historical landmarks. It is possible that San Franciscans of the present generation include some who object to honoring our pioneer dead?Does the presence in our midst of cemetery reminders of mortality irk certain persons who feel the life current pulsing warmly? We feel that the final passage of an ordinance directing the transfer somewhere beyond the county line of the venerated dust of the makers of our history is quite too brutal in its finality … Unlike the western reaches of this burial ground, the eastern part that confronts the passerby on Presidio Avenue is beautiful, it is lovingly tended, it is the Stoke Pogis of San Francisco, and its tombs bear names that explain why San Francisco became a great city. Gentlemen, you must know—because you have had every opportunity of knowing—how many of our United States Senators, how many of our Governors, how many of those others who made our beloved city, lie at rest in those few acres—in the fine old phrase, in God’s acre. 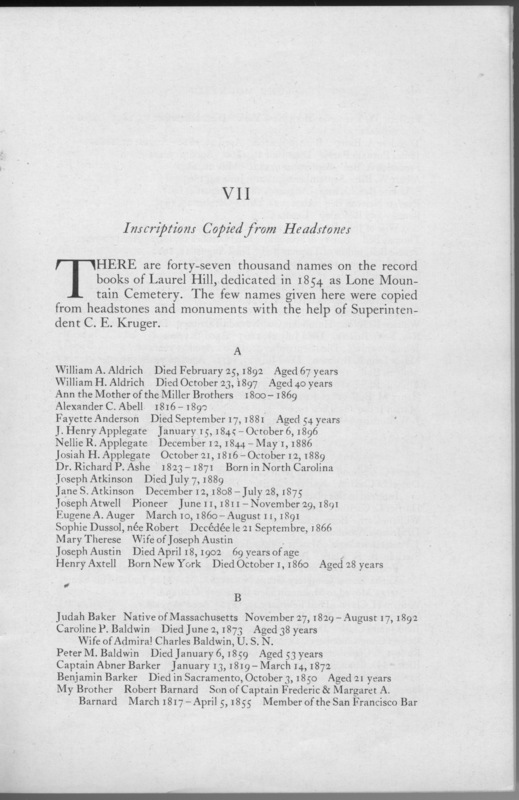 After several more unsigned articles, the text concludes with twelve pages of names copied from headstones and monuments at Laurel Hill. The list is by no means complete, since over 47,000 people are known to have been buried there. 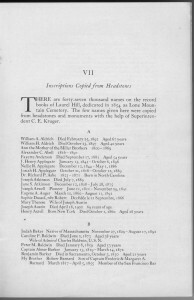 Only this section of the pamphlet has page numbers, and the numbers begin at “65”, suggesting that this pamphlet is an excerpt of a longer work. 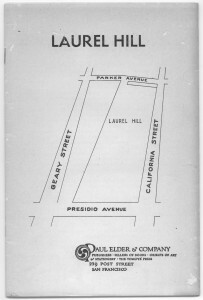 Later in 1937, the Catholic Church removed its opposition to the removal of Laurel Hill’s Catholic section, and the cemetery’s fate was sealed. The last graves were moved in the early 1940s.